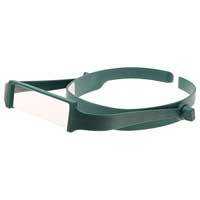 Aven Head Band Magnifier 2.25x provides hands-free magnification for more accurate and efficient viewing. The visor tilts up for normal viewing, or down for magnification. Comes with a 2.25x crystal clear acrylic lens. Flexible frame shapes easily to properly fit any size head.